OK, so your 40’s have come and gone and the nifty 50’s are a reality that can’t be avoided. But in truth, why would you want to? Looking stylish and staying on trend doesn’t have to stop just because you’re getting older, oh no! In fact, it could mean a whole new world of fashion for you to explore. It’s highly probable that comfort and ease of wear are starting to take precedent when it comes to the footwear you choose, but this doesn’t mean you have to compromise on style. With so many styles available for so many different occasions, it can feel like it’s impossible to find the right boots. 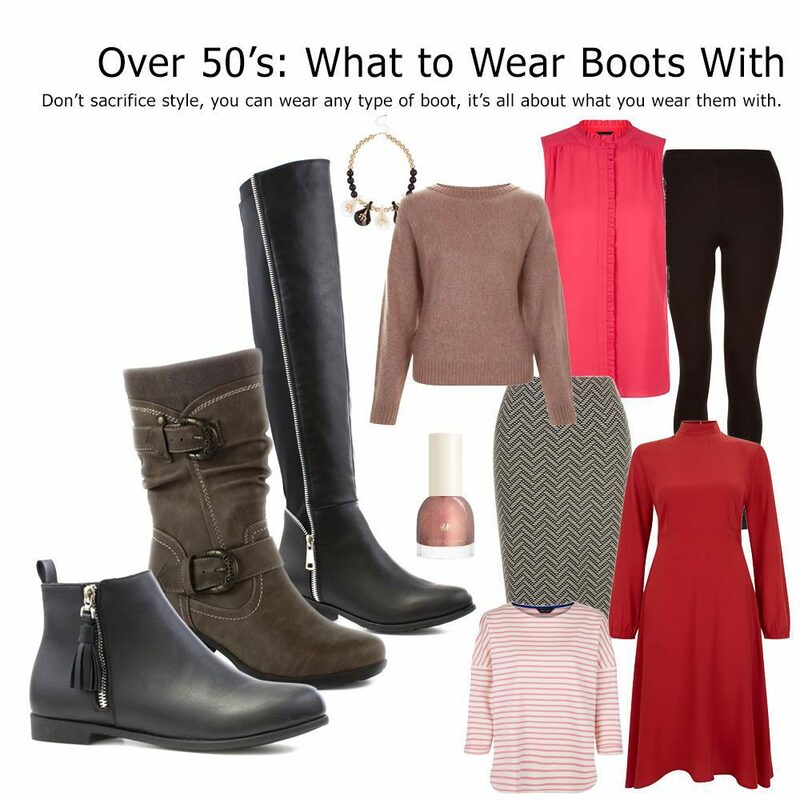 So, here we’re going to take a look at what wearing boots in your 50’s means and how you can style them to best suit you. Turning 50 doesn’t mean you suddenly have to start looking frumpy just because you think it’s more acceptable to wear certain types of clothes and footwear. There are many different ways to dress a pair of women’s boots without looking too old or too young and hopefully we’ll be able to give you just a little bit of inspiration to help make those decisions. Leggings – The idea of wearing leggings outside of the gym or over the age of 25 is likely to make some run for the hills. But stick with us… If worn correctly, leggings can be a really comfortable and often warmer alternative to tights making them a great addition to your winter wardrobe. A great casual staple, they look good dressed down with a long top or jumper and chunky ankle length boots, or if you’d prefer to cover more of your legs, they look great with knee high boots too. Avoid wearing leggings with shorter or tight tops, leggings shouldn’t be treated like trousers but more like a thick pair of tights. Jeans – Possibly the most versatile of all, jeans can be both dressed up and dressed down, with many different styles, cuts, and colours to choose from. Probably the most common jeans to wear with knee high boots are skinny jeans as they’re easy to tuck into the boot without causing them to misshape. Skinny jeans are great for all ages and are also some of the most flattering jeans available, wearing skinny jeans with boots over 50 might sound outrageous but if you’re always sure to buy the correct fit for your shape, there’s no reason why they can’t work for you. Jeans can be teamed with ankle boots, knee high boots and if you’re feeling a little daring, over knee boots are also very much on trend at the moment while still offering a certain level of modesty. Skirts – Wearing skirts with boots can be quite hit and miss if not done correctly, you don’t want to look older than you actually are, at the same time some skirts are better suited to the younger generations. A well-fitted knee length tailored skirt will offer the best option when pairing with boots, in particular, formal knee length boots. If you’d prefer something a little more casual, a lighter skirt with some stretch would work well with ankle boots or casual knee high boots. Avoid skirts that or too short as this is a younger style. On the flip side, long skirts can age you unnecessarily as well as make you look shorter. So Which Boots Should I Choose? Ankle Boots – Quite possibly the most varied range of boots, wearing ankle boots over 50 can be done with little to no fuss at all. Styles such as flat ankle boots are extremely versatile as well as comfortable and can be teamed with trousers, jeans, leggings and skirts without a problem. If wearing with a skirt or skinny jeans, a little added embellishment such as tassels or buckles can really compliment your outfit. Lace up combat boots can also add a new dimension to your look, opt for a dark brown or grey leather for a more vintage vibe. 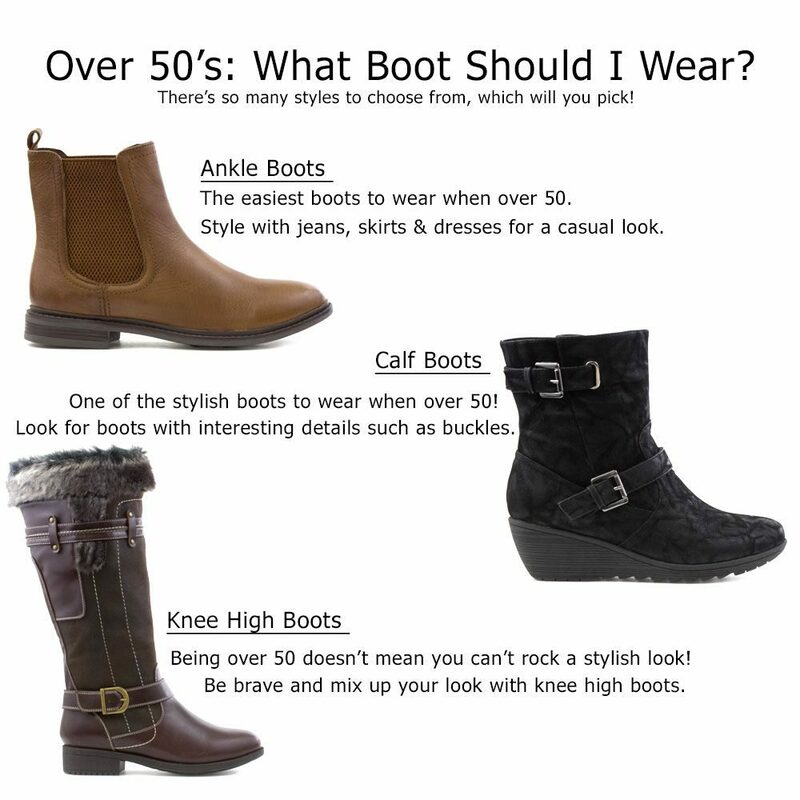 Calf Boots – Styles such as biker boots and cowboy boots can work surprising well for those over 50. When you think of cowboy boots, you’re probably inclined to think of Daisy Duke, but this is definitely a look to avoid. There are however some great alternatives for the more mature woman. If you’re going for a dressed down bohemian summer look, short cowboy boots can go really well with a nice knee length cotton dress and denim or leather jacket without looking too young. They also work well in winter paired with bootcut jeans or with skinny jeans for a slightly different look if you prefer. Biker boots are perfect for embracing your inner rock chick, wear with a pair of thick tights or leggings and a comfortable skirt and shirt combo. 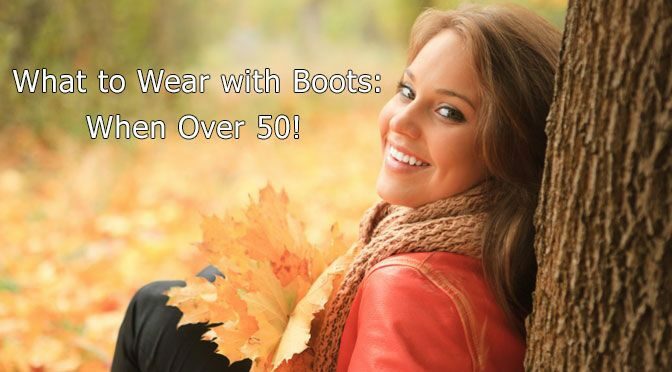 Knee High Boots – Wearing knee high boots over 50 can be a tricky one. Choosing the right boots can be the difference between looking classy and looking cheap. The most flattering style for women over 50 would be the classic riding boot, not only can they be teamed well with jeans but they can also work well with leggings or a skirt and tights. They’re also extremely comfortable and are perfect for winter. If you’re looking for something a little dressier, a kitten heeled knee high boot would be the perfect footwear for more formal occasions. As we get older, it can feel like looking the part is becoming more of a chore, but it certainly doesn’t have to be that way. When it comes to choosing the perfect boots to wear with your outfit, we’re certain that following our guide will mean you’ll always be stepping out in style.